The move of the United Democratic Party (UDP) to project its candidate as the “common candidate” of the Meghalaya Democratic Alliance (MDA) in the upcoming Lok Sabha polls from Shillong Lok Sabha constituency is unlikely to become successful with the coalition partners not taking any decision on the issue. 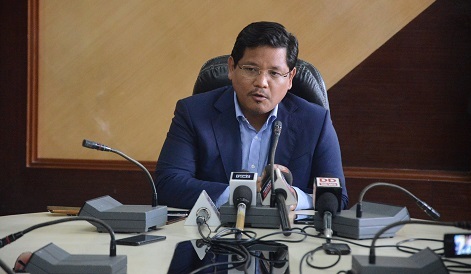 A meeting of the MDA Coordination Committee chaired by chief minister Conrad K Sangma was held on Monday evening which was attended by leaders of all parties that formed the MDA government. The MDA government was formed by six political parties which comprised of the the National People’s Party (NPP), UDP, People’s Democratic Front (PDF), Hill State People’s Democratic Party (HSPDP), BJP, NCP and Independents. After the meeting, the chief minister told reporters that all political parties were heard during the meeting and it was decided that the issue should be first discussed and a decision will be taken by the respective political party and come back to the MDA Coordination Committee. Without discussing in the MDA Coordination Committee, the UDP had earlier projected that its candidate from Shillong Lok Sabha seat should be accepted as the common candidate of the MDA. The UDP had even stated that a candidate of the NPP should be considered the “common candidate” of the MDA from Tura Lok Sabha seat. The UDP has received applications from two former legislators, Paul Lyngdoh and Jemino Mawthoh who are vying for party ticket for next’s year Lok Sabha polls from Shillong Parliamentary seat. The UDP has decided to declare its candidate on October 31.